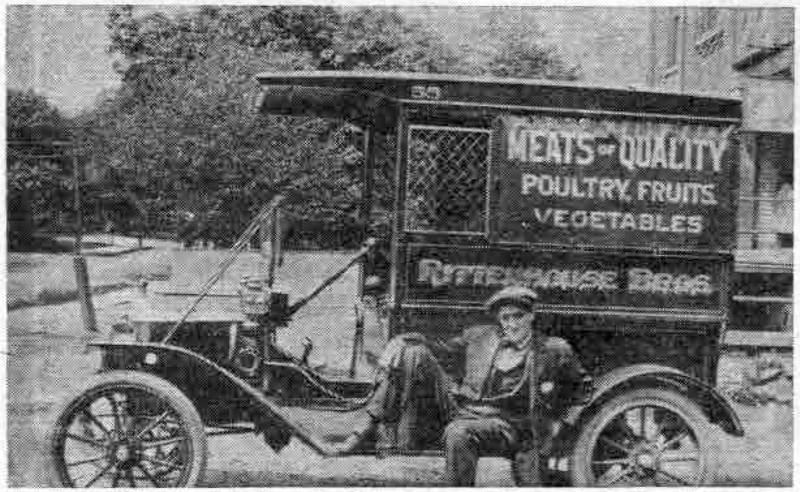 Today’s column shows an interesting array of pictures of old-time automobiles, all of which were, at one time or another, familiar sights on the streets of Wayne. These pictures have been gathered from three different sources, the first having been left at “The Suburban” office by Frank Cressman, of Beechtree lane. The second was lent to the writer by Otis Hunsicker, of Conestoga road, for use in this column, while the third came from Ted Brooks’ interesting collection of pictures of old cars. According to a notation on the back of the first picture, it was taken in 1914. It shows Frank Cressman of Beechtree lane, seated on the running board of one of the first delivery trucks on the entire Main Line. At that time, Rittenhouse Brothers’ Store was located in Masonic Hall, on South Wayne avenue – the building so easily recognizable in the background of the picture, due to the minimum of changes made to the building during the years. Written in faded ink on the back of this picture is the date, “Sept. 15, 1907,” which clearly indicates the car’s antiquity. Mr. Hunsicker tells us that the late Ted Wendell, then a young man, is seated at the wheel of Herman Wendell’s Stoddart Dayton, with the late Mark Heilner beside him. The house in the background is the home of the late John P. Wood, which faces on Radnor Street road, between Poplar avenue and Walnut avenue. This car, originally owned by the Hunter family, belonged to Hyde W. Ballard, of Paoli, when this picture was taken around 1940. At this time it was regarded as a real antique. With the passing of the years, the original body of the touring car (or roadster) had been transformed into a truck. In this picture it is loaded with a large drum of oil. In his 1926 Cadillac car, which he owned before his present 1912 White touring car, Ted Brooks had driven Mr. Ballard and Mr. Samuel Bailey, of Bala-Cynwyd, to the Folwell farm, on the Maryland-Delaware State line, to pick up the 1909 Packard. All three were members of the Antique Automobile Club of America. 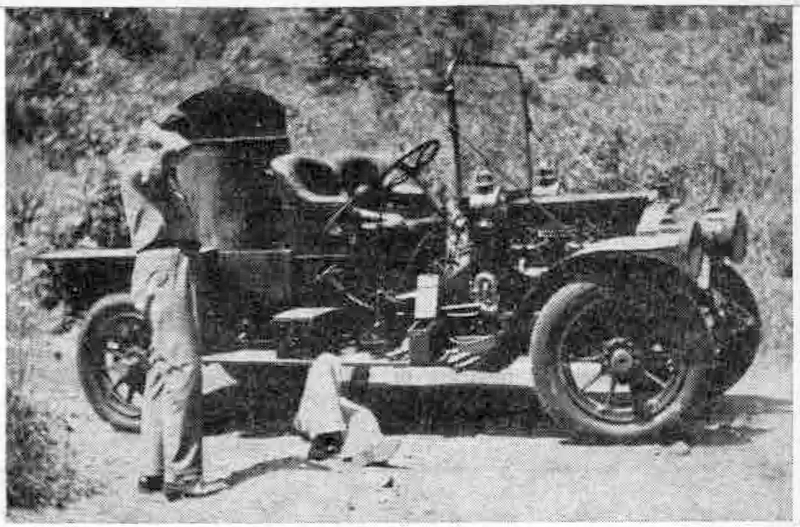 On the return trip, when Mr. Ballard and Mr. Bailey were driving the Packard, trouble developed along the road, as this picture taken by Ted Brooks clearly indicates. Mr. Ballard is under the car and Mr. Bailey is standing nearby. Eventually, the trip was resumed and successfully completed, according to Mr. Brooks. In his search for pictures of old local automobiles, “Ted” Brooks, Wayne’s best known authority on the subject, has obtained for use in this week’s column two unusually interesting pictures. The first shows an old car of the J.M. Dotterer family, while the second shows one that belonged to the W. Allen Barrs. For many years both families were prominent in the life and activities of Wayne. 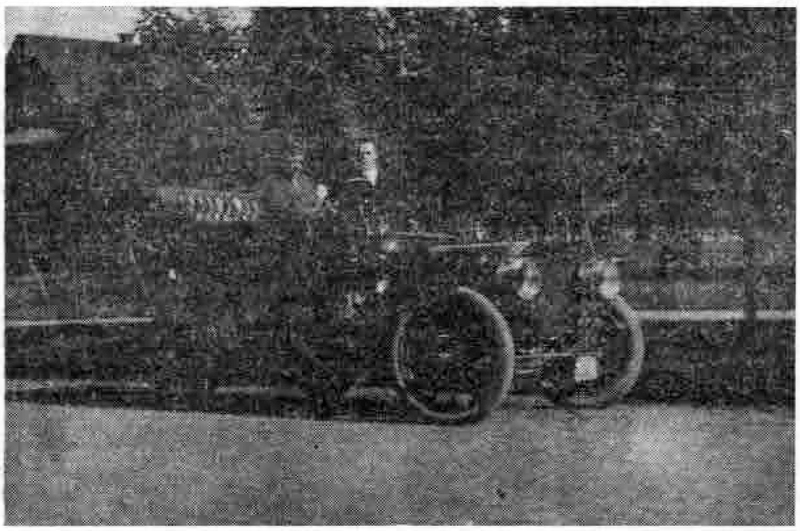 When it made its appearance on the streets of Wayne in the early 1900’s this car was probably almost as much of a curiosity as it would be if it should make its re-appearance now. Fifty years ago, cars of any kind were few and far between in any community. This shiny black Autocar was a very large and handsome affair, with its big wheels, solid rubber tires and its body high above the ground. 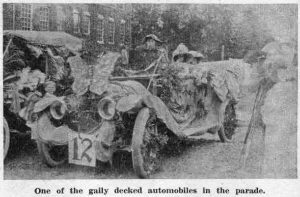 The little girl in the front seat is Mary Dotterer, now Mrs. Howard Harbison who, with her husband, presently resides in Louella Court. 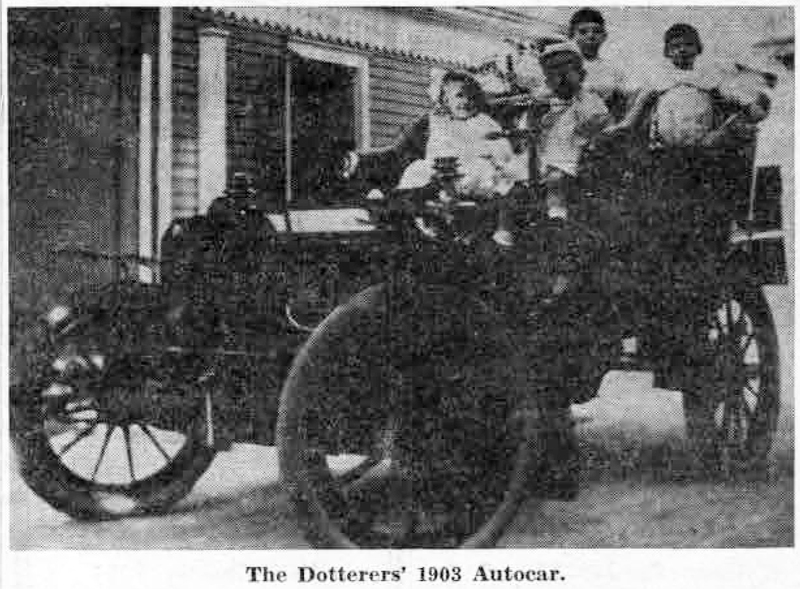 Beside her is her brother, Amos Dotterer, now deceased, and in the back seat are two small visiting cousins. The car is parked at the side of the house, at 123 Bloomingdale avenue, which, in 1892, had been purchased from Robert Smith by Amos Dotterer, father of John M. Dotterer and grandfather of the children in the automobile. The block on Bloomingdale avenue, located between West Wayne and Lancaster avenues, is the first real residential street in Wayne. The elegant mansard-roofed houses on either side of it antedated those of the Wayne Estate by ten years or more, as the former were built in the early 1870’s. According to Mrs. Harbison, the Dotterer house was originally long and narrow, almost identical with the house across the street from it, now occupied by Captain and Mrs. James H. Bones. Grandfather Amos Dotterer made various alterations and additions to his house after he had purchased it. Following his death in 1900, John M. Dotterer bought the old home from his father’s estate. Until 1910 it was only a summer residence for Mr. and Mrs. Dotterer and their children. After 1910, it was completely modernized for year-round residency – a large and comfortable home for some years for Mr. and Mrs. Dotterer and their three children, Evelyn, Mary and Amos. In 1946, Mr. and Mrs. Dotterer, two of Wayne’s best known residents, celebrated their golden anniversary in the family home. Two years later Mrs. Dotterer died. Her death was followed by that of her husband in 1953. Their Bloomingdale avenue house is now being altered into a small apartment house. This picture was taken on Eagle road, near the former home of the late Mr. and Mrs. Allan Barr, on the southeast corner of North Wayne avenue and Eagle road. Later, the Barrs moved to Windermere avenue, where they lived for several years. Located to the west of Windermere Court Apartments, the Barr home has now become a small apartment house. 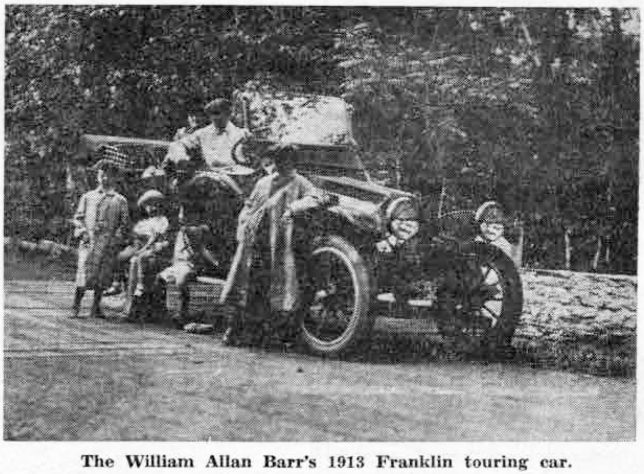 In the picture shown above, Mr. Barr is seated behind the wheel of his 1913 Franklin touring car while Mrs. Barr is in the back seat. 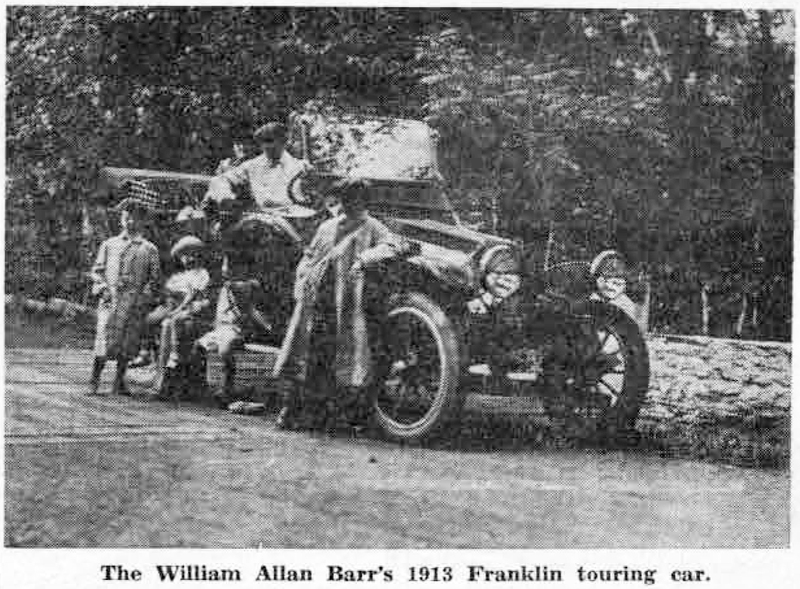 The children standing beside the car are Allen, John and Henry Barr with one of their contemporaries from the J. Wynn family. 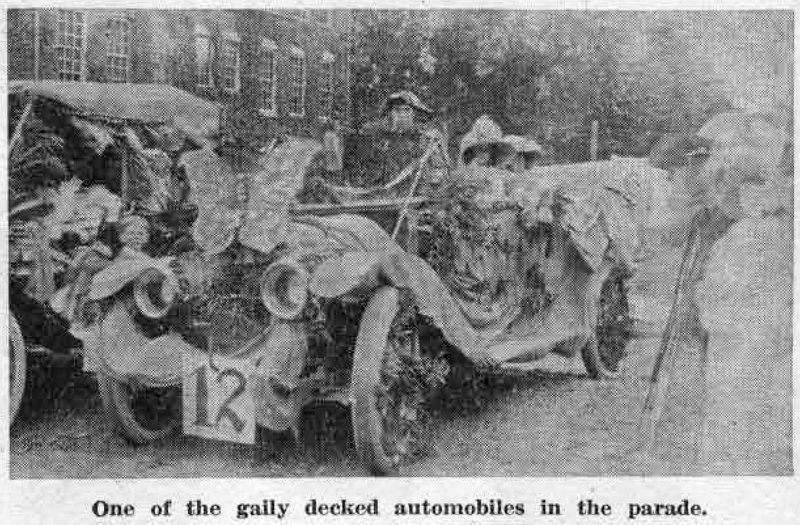 What was it like to go on a honeymoon trip by automobile in 1906? In particular, what was it like to go from Philadelphia to the Catskill mountains in early May of that year, in a chain driven Horsman automobile? The groom had to stop every few miles to repair broken links of the chain, while his bride sat on the porch of a nearby house, on a conveniently located fence, or on the grass along the road. 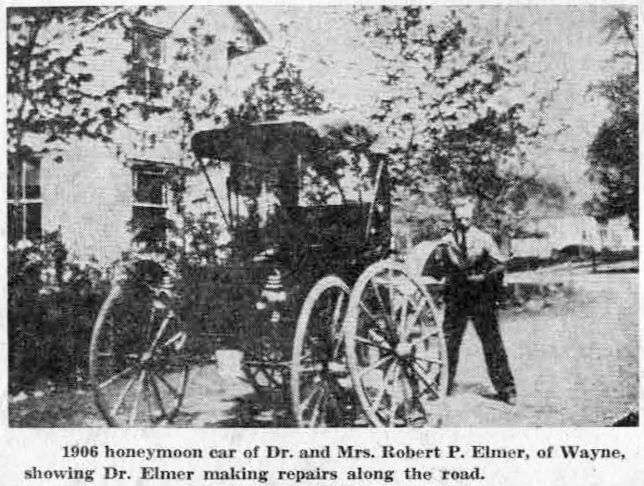 During the past week, the story of just such a honeymoon was told your columnist by Mrs. Elmer, widow of Dr. Robert P. Ebner, for many years one of Wayne’s best known physicians. Dr. Elmer died on March 4, 1951, after 47 years of continuous medical practice in Wayne and vicinity. When Dr. Elmer, a native of Bridgeton, N.J., came to Wayne in 1904, he bought the house just opposite the Wayne Methodist Church. One of the Wayne Estate houses built in the 1880’s, it looked then very much as it does today, except for a large addition on the west side of the house. Here Dr. Elmer established his practice in 1904 in the office he was still maintaining at the time of his death. Beginning with his great-great-grandfather, Dr. Jonathan Elmer, he represented the last of the longest line of physicians in the United States. When Dr. Elmer first started his round of visits to patients in 1904, he drove “a little Oldsmobile car that would not go up any hill, but had to be pushed and pulled,” according to Mrs. Elmer, who adds, “and then the Doctor read that a Horsman car would climb any hill.” That first Oldsmobile had been a one-seated car without a top, “a very nice looking car” as Mrs. Elmer remembers it. The Horsman, which looked “like a buggy,” as the accompanying picture very plainly shows, was made in the mid-west, one of the earlier American cars to appear on the market. Imagine the May day, on which the Elmers started on their honeymoon. Roads were narrow and rough, or of the “corduroy” variety. Once they had to cross a small stream, by way of a bridge which was drawn back and forth across the water. In spite of the fact that the bridge had a railing on each side, Mrs. Elmer was fearful every moment of a sudden plunge overboard. In the spring of 1904 some of the small hotels were open even in May – “many of them quaint and always comfortable,” according to Mrs. Elmer. And Dr. Elmer, who had spent much time in the Catskills, knew the location of these small hostelries and tea houses and various other eating places where good food could be obtained. And so that May-time honeymoon of 49 years ago, taken in the buggy-like automobile, had a charm all its own, far exceeding any of this May of 1955. The narrow, tree-shaded roads that the Elmers travelled then have become broad and noisy automobile highways, lined with gasoline stations and hot dog stands. In commenting on the parading bicyclers, “The Suburban” of that week says that “the picture the kiddies presented as they gravely passed in review before the judges is one long to be remembered.” Other events of the day for this age group were midget relay races, hoop races, pushmobile races and track sports. The writer has looked in vain for a picture of the automobile described in a recent column as having “a gigantic moose head, typifying the Bull Moose party” on the front of it; although a big butterfly is a far cry from a moose, here at least is a car with that decoration on its radiator. The serious youth holding the ribbons has not been identified, nor have the small girls who are almost smothered under their mothers’ hats. However, the small boy at the left is Francis deMarse, who was shown standing by his father’s ice cream stand in the recent column. The identifying “12” on the front of the car may be recognized by some of the old timers among our readers. “The Suburban” listed the following as having cars in the parade: Mrs. Adolph Gosling, Allan Hale, Herman Wendell, Fred H. Treat, R.H. Wilbur, Walter Whetstone, Dr. J.W.L. Ward, W.B. Riley, Charles H. Quinby, M.C. McMahon, Robert Dornan, 2d, Ira V. Hale, T.T. Worrall and Sons and Rittenhouse Brothers, as well as the Radnor Fire Company’s automobile truck, driven by former Chief Charles E. Clark, and the chemical engine in the charge of Engineer Paul Cummings. Silver cups were awarded as prizes to the two best entries, chosen by popular vote. They were Charles Quinby, first, and Robert Dornan, second. 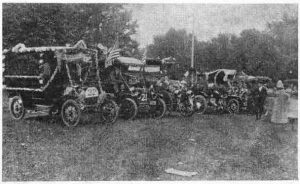 Doubtless, some of these automobiles appear in the line-up shown in the picture below, with the Rittenhouse Brothers and T.T. Worrell trucks closest to the camera.